A working ranch since 1887, this is the real deal if you want to be part in a cattle drive that is over 40 miles and gives a true cowboy experience, including sleeping out on the range in tents. The cattle are trailed between the Big Horn Mountains, and the scenery ranges from 4,200 feet in elevation to over 9000 feet. This is not a nose to tail cattle ride as the terrain can be rough in places, and they have horse for everyone. The cooking is a 5 star Dutch oven, cooking over hot coals. You will see stunning scenery during the day and amazing stars at night, these trips are limited and therefore book up very quickly, so don’ t miss out on a truly authentic experience. 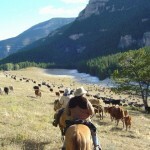 There are 5 cattle drives available, a late spring/early summer drive to the Mountains, where the cattle are trailed from the foothills to the summer range on top of the Big Horn Mountains, 6 days/nights covering 45 scenic miles. Beef Roundup, takes place twice during the summer where the cows are moved to another pasture, which sounds simple but the first few days are taken up by the cattle gathering before the drive starts, September Cattle Drive is the longest trip 7day/nights which starts at 9000 feet and ends in the valley, as this is September the weather is varied so expect anything from hot sun to snow! Clean up Ride is the final ride which aims to find any cattle previously missed, generally you will ride the entire 100,000 acres during the week, although this can be the coldest trip in the event of snow there is a cabin for meals. From £2595 pp - Camp/hotel accommodation, meals, horses, tack, activities, transfers, taxes and gratuities.